CoinGeek.com announces funding of up to USD $300,000 per year for Bitcoin Cash (BCH) open source projects to be developed by the Electron Cash team. Electron Cash is an electronic wallet tailored for the BCH chain. nChain, the blockchain research & development specialist, will support the new Electron Cash development projects with technical expertise and intellectual property licenses. This new Electron Cash initiative comes hot on the heels of CoinGeek.com's funding of another open source project, Terab, which aims to facilitate terabyte size blocks* on the BCH blockchain. Led by Jonald Fyookball, the Electron Cash team believes that Bitcoin Cash is the true Bitcoin, and fulfils the Satoshi Nakamoto white paper's vision for a peer-to-peer electronic cash system. The Electron Cash team will use CoinGeek.com's funding to professionalize its development groups, so they can devote more time to creating software projects for the Bitcoin Cash ecosystem. All software created in this initiative will be made available to the public for usage under an open source license, but only for usage on the BCH chain. The Electron Cash team will manage all development. Enhancing CoinGeek.com's financial investment, nChain will provide technical advice, support from its research and development team members, and intellectual property licenses when relevant for selected projects. nChain's Chief Scientist Craig Wright will work with the Electron Cash team to advise on projects. In addition to this partnership with Electron Cash, CoinGeek.com intends to support more initiatives that will enable global growth and adoption of Bitcoin Cash. If you are a developer or technology venture that needs funding to develop projects or applications for the Bitcoin Cash chain, send your pitch via http://coingeek.com/contact. Paycoin launched on 12th December, kickstarting both a sharp jump in hosted mining prices and a period of sustained trading on several altcoin exchanges. The coin has attracted attention due to the ongoing discussion surrounding GAW Miners, promises of crypto 2.0 functionality and a commitment to shore up its price at $20. The altcoin saw significant amounts of hashing power both at launch and since, with as much as 50 PH/s directed toward the coin at fluctuating periods during the week. With 12m paycoins already premined for the company’s investment partners and customers, only about 500,000 paycoins are available for public mining. The paycoin launch took place amid continued scrutiny of US-based GAW, which is in the process of shifting from a cloud mining-based business model to that of a cryptocurrency payment service and altcoin development team. In past comments, GAW staff, including CEO Josh Garza, have said that the shifting landscape of the mining industry requires change, though critics and customers have voiced scepticism about the bitcoin firm’s evolving nature. The paycoin launch comes months after GAW first announced the project. The company made its name as a hardware reseller. Earlier this year, it shifted to rig hosting and later began offering cloud mining services. This evolution hasn't taken place without issue, however. GAW continues to face accusations of misleading its customers, criticisms that ultimately came to the fore in a comments section melee for a recent story on the WSJ BitBeat blog. Similar debates about GAW and its practices have played out on social media platforms as well, with detractors alleging fraud and misrepresentation and supporters dismissing those concerns as factually unsound. The company has also been dogged by complaints regarding platform glitches, low payouts and an overly active approach to moderating its forum, Hash Talk. The coin launch sparked a competitive race between a few public pools that emerged following the Friday release, including pools hosted by SuchPool, MinerPools and others. At least one operator has sustained several DDOS attacks, a tactic seen during other coin launches as pools vie for blocks and the rewards they offer. As with many altcoin launches, a small number of pools have dominated the race for blocks, with MinerPools controlling more than three-quarters of the paycoin network over the weekend at one point. Several altcoin exchanges, most notably Coin-Swap, were among those who first listed the coin. In early trading the price for a single paycoin reached $24 – that trend has since declined, and at press time, paycoin is trading at an average of 0.02 BTC, or about $6. Coins have also been made available for sale on the official paycoin site for $20 apiece. GAW staff, including Garza, have indicated that the listing was unplanned and that a broader exchange roll-out is pending. Coin-Swap staff say that communications with the company were friendly and contributed to a smooth – if not high-volume – integration. At the time of this writing, the 24-hour volume for Coin-Swap’s paycoin market is about 850 BTC. The rush for rig rentals appears to have relaxed alongside the price of paycoin. According toNiceHash, the cost for a 24-hour rental has fallen to roughly 0.035 BTC per terahash. Paycoin is a fork of peercoin, an early descendent of bitcoin that was the first cryptocurrency to deploy the proof-of-stake transaction verification system. Under proof-of-stake, miners utilize their own coin holdings rather than hashing power to process transactions and generate new coins. GAW cited peercoin's long-standing position as a crypto project as the driving factor for choosing to fork paycoin from it. The paycoin source code can be found here. How the paycoin network will be managed makes it unique among altcoins today, including peercoin. GAW has sold proprietary wallets in advance of the coin launch, as well as allowed customers to exchange existing mining contracts for the wallets. GAW has said that it will manage these wallets out of its existing data center space. The network as a whole plans to be supported by a kind of masternode structure similar to the one deployed by darkcoin. GAW’s white paper outlines how this infrastructure will help propagate transaction data, and the company itself plans to operate a number of these nodes. According to GAW, major changes to the existing peercoin codebase include per-block difficulty targeting and variance for large swings in hashing power. This, the company said, is the reason for the fluctuating difficulty that paycoin miners may be seeing at this time. Garza explained that the base infrastructure for paycoin’s additional mechanics is in place, though other elements of the paycoin project are in active development and are being tested, he said. In past statements, both Garza and members of the GAW community have speculated that paycoin will address the flaws they see in bitcoin, pointing to price volatility and the need to wait as much as an hour for transactions to settle. By shifting its resources to focus on the project, GAW is betting that paycoin can compete with bitcoin as the digital currency of choice. In a November interview with Mint News Press Garza suggested that ultimately, consumers will pass over bitcoin in favor of other options. “I don’t believe that the bitcoin has a chance to be a viable currency," Garza said at the time. Paycoin’s proof-of-work phase is expected to end in the next 48 hours, after which time the network will shift to proof-of-stake verification. In the meantime, GAW customers and critics alike have begun speculating on the future of the project. On Monday, GAW is expected to launch a new money management platform, PayBase, as well as begin offering price support for the currency, though recent comments on social media from staff including Garza suggest that it may take “some time” before the paycoin price sees stability. Though funds have reportedly been distributed to the company’s investors, it remains unclear when customers will be actually be able to start accessing funds. Earlier this week it was announced that customers will need to submit personal information before receiving access to funds on PayBase. As well, the platform's original launch date was shifted from this coming Friday to Monday. Garza has since clarified in a post on Hash Talk that a potential solution is in the works that will enable access without prior verification, but said that compliance with KYC regulations has reduced available options without those steps. Questions have also been raised about the name “paycoin”. According to Bitcoin Talk, stakeholders to an existing project that uses the same name (sign: PYC) and has been traded on exchanges like Cryptsy since September 2013 are voicing opposition to GAW’s launch, claiming that the company improperly filed for trademark ownership. GAW has countered that stakeholders are looking to take advantage of the company’s success. GAW said its focus is on releasing its new platform as it shifts away from mining and toward new services like digital currency e-commerce solutions. This, as well as maintaining and building out its new cryptocurrency network, remain top priorities. “We are developing a strong platform for Paycoin which will support the idea of having it integrated in every day life,” Garza said. Flickinger, 37, a software engineer and IT consultant by trade, doesn’t leave the house much these days. He’s a full-time Bitcoin miner. As with an actual precious metal, Bitcoins are in limited supply—they must be “mined.” Unlike with precious metals, this mining is done purely by computer. 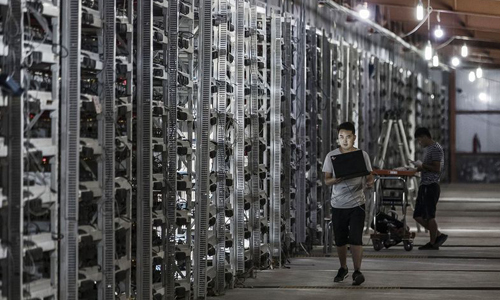 Miners set their machines to run a series of complex calculations that tally up and certify all the transactions of other Bitcoin holders around the world. If the miner’s computers complete these calculations and solve a complex mathematical puzzle before anyone else, he earns about 25 Bitcoins as payment. It’s a nice haul: With the price of each Bitcoin nosing up near $1,000, that’s $25,000 for 10 minutes or so of work. For the moment at least, miners are the rare grunts who can also get rich. Over the past six months the price of a Bitcoin has shot up, dived, shot up again—and kept on rising, making Bitcoin mining one of the most frenzied corners in technology. Engineers are racing to design and build unique chips that crunch Bitcoin algorithms at high speeds. Thousands of entrepreneurs like Flickinger are betting that their ability to harness these complex computer systems will make them rich—and maybe create a new world order along the way. Flickinger is part of a group called Give Me Coins that pools together its computing power to have a better shot at verifying transactions and solving the cryptographic puzzles first. 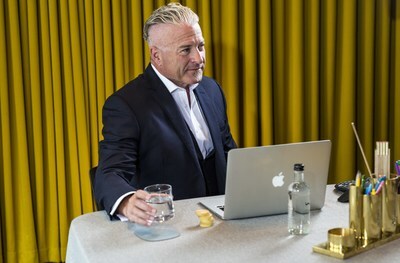 He spends much of his time chatting online and monitoring his account on Give-Me-Coins.com, which shows the group’s progress and his share in the work. His setup currently accounts for about 10 percent of its total computing muscle. With more and more publicity about Bitcoin, more people are mining and blocks are being discovered at a rate faster then every 10 minutes causing the difficulty to increase. So it is now harder then ever before to mine Bitcoins.